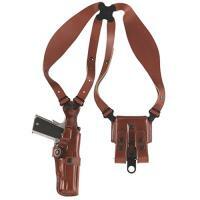 Galco Ambidextrous Vertical Shoulder Holster System (Tan) FREE SHIPPING! Combat-proven in Iraq and Afghanistan, the VHS® has been field tested over military uniforms and general hunting clothing with great success, and thousands are currently in use by American armed services personnel fighting the Global War on Terrorism. A key component of this patented shoulder system is its spider harness. All four points of the spider harness can pivot independently and are connected by a clover shape, trademarked Flexalon® swivel back plate. This, along with patented swivel connectors, results in a perfect fit and lasting comfort for virtually all body sizes and shapes. Made for semiautomatic pistols and double-action revolvers, the VHS is ambidextrous and available in Tan finish. It is disappointing that the components cannot be swapped out when ordering. If you have a revolver, you get pouches that hold loose ammunition and have to buy the speed loader holder in addition to the complete system. The holster itself fits the weapon perfectly and is great quality. I would be ordering this shoulder rig for a Ruger GP100 with 6" bbl. The ammo carrier would be a speedloader pouch, rather than a magazine carrier for autopistols, correct? Revolver holster systems are shipped with dual drop pouches for loose cartridges. Does this rig come with a tie-down included? The VHS was designed to function without a holster side tie down and will not accommodate one. ©2002-2019 CopsPlus.com: Galco Ambidextrous Vertical Shoulder Holster System (Tan) FREE SHIPPING!